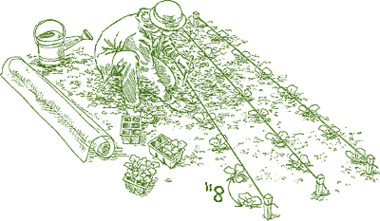 A guide to getting started with planting your seeds. There are a few requirements to get those seeds on the right track! You can start your seeds in a container or hotbed/cold frame. Most gardeners want to jump right into their gardening projects; however, before starting your seeds, you should make necessary preparations. Some seeds have special light requirements. If the planting instructions do not include specific light requirements, then light does not play an important role in germination. Although most seeds don't need light to germinate, seedlings need lots of light to grow;12 to 16 hours of sunlight a day is best. A south-facing window may work, but you are better off starting your seeds under special fluorescent bulbs. These bulbs provide the appropriate light intensity and solar spectrum colors required for plant growth. 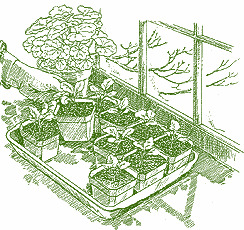 Place them 4 to 6 inches above the seedlings (raise them as the plants grow). The temperature requirements listed for germination refer to soil temperature, not the air temperature. Some gardeners use heating cables or propagation mats to provide the bottom heat that can aid in seed germination. 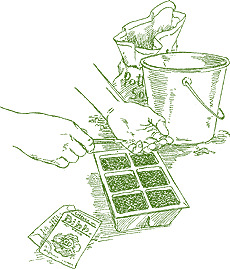 Once germination occurs, move the seedlings into a cooler location (65-70° F) to produce stocky transplants. Seeds started indoors benefit from using a sterile, soilless germinating mix. You can purchase a ready-mixed blend or mix your own with equal parts vermiculite, sphagnum moss and perlite. Avoid using soil from your garden or standard potting soil. It is too heavy to drain well enough for seedling root development and may harbor diseases that could kill your seedlings. If direct seeding in early spring, choose a location with loamy soil that has been well-worked and loose. Avoid sandy or compact clay soils. Seeds germinate and grow at different rates, so timing is very important. Make a weekly schedule long before you start planting (this is a great winter project). You can find the timing recommendations on the seed packet. A garden journal is invaluable for keeping track of seed starting and germination dates for future reference. Use the Dig The Dirt garden journal in your personal profile to keep track of your seeds. You can start your seeds in almost any container as long as it is at least 2 to 3 inches deep, has good drainage holes, and is clean. Cut-off milk cartons or plastic jugs are just some of the things around the home to use. You can also purchase containers such as flats, trays, pots, or compressed peat pellets. Make sure to clean and disinfect previously-used products before use. Keep indoor space availability and garden needs in mind when planning how many seeds to start. Without adequate space, plants become weak and floppy and could develop tangled roots that will not transplant successfully into the garden. Because pots take up more space than seedling flats, remember to plan for the extra window or light space. Alternatively, you can sow individual seeds into large pots right away, or delay seed starting and transplant very small plants directly into the garden. However, this will delay bloom in the garden. Thanks for posting this - it&#x27;s exactly what I needed to read to get ready for my tomato seeds!